Snow totals continue to build across the state leading to dozens of accidents as motorists seek to make it through the storm. Most school districts in the state have already sent students home for the day and most evening activities at schools have been canceled. 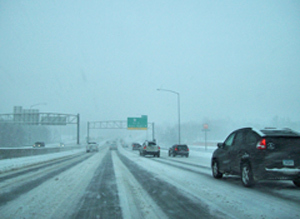 The Iowa Department of Transportation is reminding travelers that conditions in town can be dramatically different than those in unsheltered rural areas. Snowfall today is expected to intensify around noon, with heavy snowfall this evening. Southeast and northwest Iowa are expected to receive 4 to 6 inches, and the balance of the state could receive 10 to 15 inches. 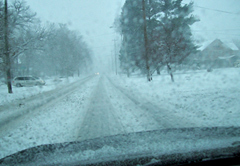 With all of this snow, rural areas are likely to see significant blowing and drifting throughout the day on Wednesday. Winds are expected to be steady at 25-30 mph, with gusts of 40-50 mph. Visibility could be near zero in many parts of the state. Large drifts could restrict available lane width or block roadways entirely. View of snow through car windshield. Over the next few days, motorists are urged to use available tools, including calling 511 or logging onto 511.org. There are two versions of this website, both contain the same information, but in different formats. If access to the high-band version is slowed due to demand on the system, the Iowa D.O.T. suggests using the low-band version. The National Weather Service says a winter storm warning is in effect until 9 tonight and blizzard warning remains in effect for the entire state today from 9 P.M until 6 P.M. Wednesday. Find out more at the National Weather Service website here.